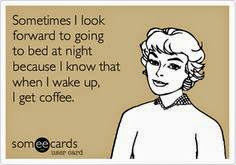 Welcome back today, friends! Today I'm sharing another sweet card I created using some more of my Paper Sweeties favorites. 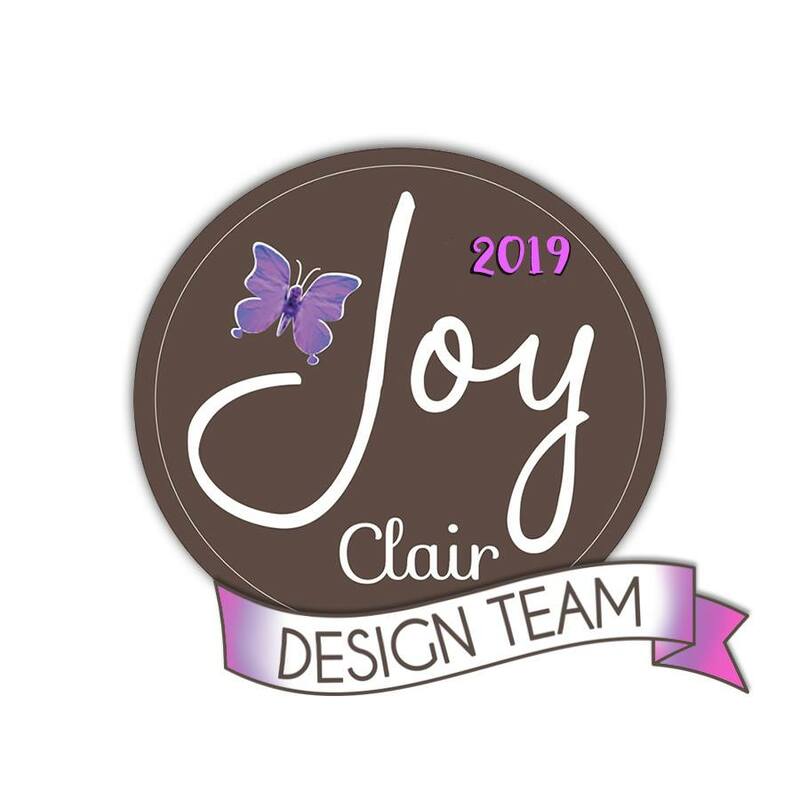 While it's always fun seeing a new release, it's also a whole lot of fun revisiting all the FABULOUS stamps, dies and embellishments that you can find every day in the Paper Sweeties Shop. 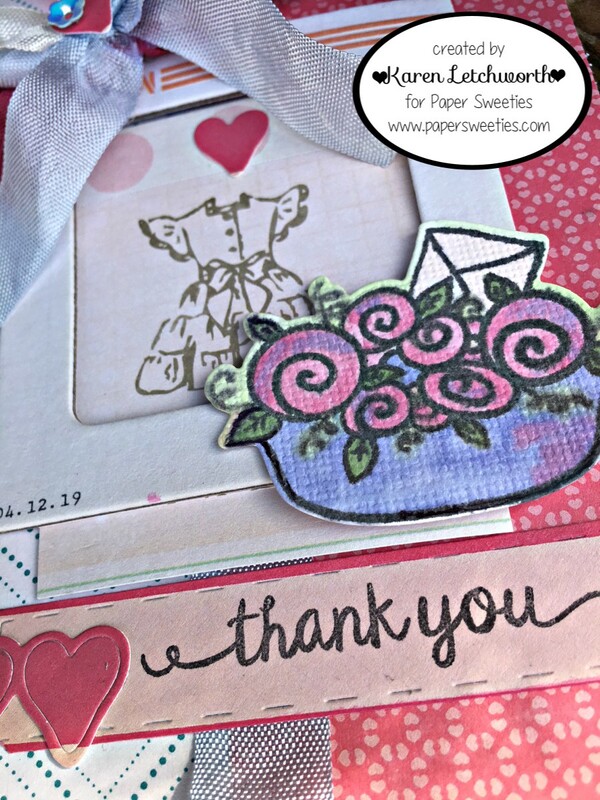 They have so many sweet stamp sets with matching sweet cuts (die-cut sets), gorgeous shades of vintage-style Crinkled Seam Binding, Paper Straws, Flower-Shaped Sequins, and SO much more. Here's what I created today using some more of my favorites. I started with some patterned papers and chipboard. I ran a length of Blueberry Seam Binding up my card, and used the Blueberry Seam Binding, Frosting Seam Binding and Raspberry Seam Binding to tie a big fluffy bow. There's also a snippet of a Paper Straw sticking out of my bow. I stamped the adorable floral basket from the Thank You VIP Set, and used this set again to stamp the sentiment (thank you). The sentiment is stamped onto the banner from the Sweet Borders Sweet Cuts, and I also added some hearts that were cut from another die found in the Sweet Borders Sweet Cuts. On top of the pink hearts, I added some ADORABLE Robin Egg Sequins. There are just SO many sweet products to help you create something extra sweet. 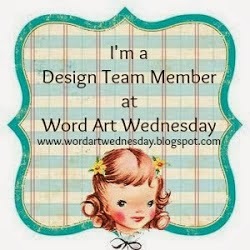 Here are the names and links to all my talented Paper Sweeties team-mates who have prepared something special for you today using a few of their person Paper Sweeties favorites. 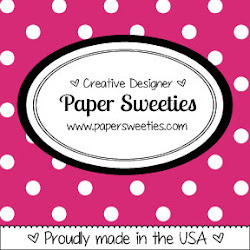 You won't want to miss out on any of the fabulous inspiration, or this opportunity to stock up on some extra sweet products from Paper Sweeties. 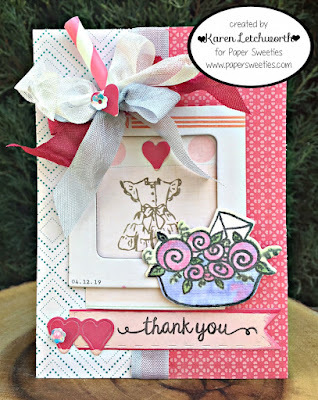 Simon Says Stamp - Wednesday Challenge Blog - Add a Die - I used a Paper Sweeties die cut (a sweet cut set called Thank You) on the flower basket as well as a Paper Sweeties die-cut set called Sweet Borders Sweet Cuts for the heart border and sentiment banner. A darling sweet card with the little vintage dress, Karen! Lovely papers and hearts! 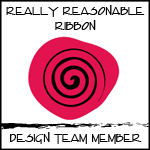 Sweet ribbon treatment, too! Karen, this is adorable. Love the stamps.